Have you ever had a lava cake? If not you are most definitely missing out. I suggest trying one asap and I guarantee you’ll say “where has this been all my life?!”. 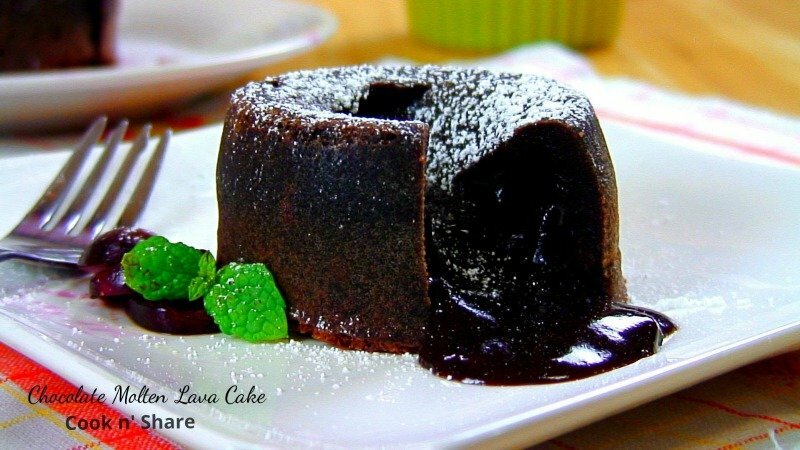 Lava cake is a small chocolate cake with a gooey chocolate center that spills out like lava when cut into, thus the name. Today I ventured over to The Cook N Share YouTube Channel to explore just how lava cake is made. I am not gonna lie, my mind was blown. It was SO much simpler than I had imagined! I had always thought it was two separate recipes put together, one for the lava and one for the cake but *SPOILER ALERT* it is one batter that bakes on the outside but also leaves the chocolaty lava center! Perhaps I am the only one on earth who didn’t know that but it was an exciting moment nonetheless. Boil some water in a saucepan and a place a bowl over it. Making sure the bowl doesn’t touch the water. Place the chocolate chips and butter in the bowl. Whisk until the chocolate and butter melt and become well incorporated. You can also microwave them to make them melt faster. Just make sure you don’t burn the chocolate. Turn off the heat and allow the mixture to cool. Set it aside. In a separate bowl, add in the eggs, vanilla extract and confectioner’s sugar. Beat using an electric mixer or whisk until everything is well combined and the eggs are pale in color. Add the chocolate mixture and whisk well. Sift the flour into the mixture and whisk until it’s smooth and well incorporated. Spray the ramekin cups with baking spray. You can use melted butter, as well. Pour in the batter until the cups are 3/4 full. Bake in a preheated oven at 450 degrees F (232 C) for at least 14 minutes. (Small ramekins might take 10 minutes only). Remove them from oven and allow them to cool down for a few minutes. The cakes should come free of the cup walls automatically after a couple of minutes. Carefully go around the edges of the cups with a sharp knife to make sure they have loosened. Cover them with a platter and flip them . Pull away the ramekin cups. Serve your molted lava cakes with slice raspberry, strawberry, or vanilla ice cream if you wish. Slice and serve. 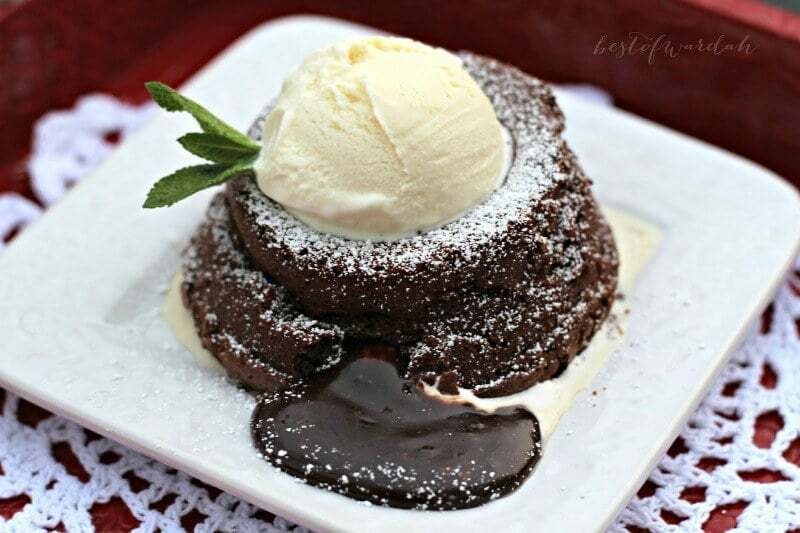 Enjoy your molten lava cakes! 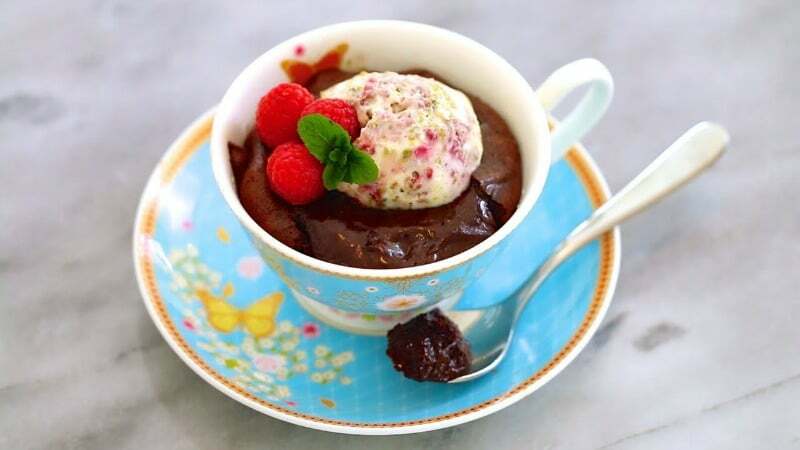 Lava cake can be taken out of the ramekins and plated with a little ice cream and a lovely garnish. Or they can be eaten straight from the ramekin or in this case adorable little teacup if you just can’t get it in your belly fast enough. Check out Cook N Share’s tutorial below to watch how to make this special dessert!